Nothing too exciting on the Westfield front. I took advantage of the wonderful weather we’re having by stripping more parts off of the old Miata. I’d be nice to get that done before winter really sets in. I got all of the parts of the parking brake out today. Most of that gets reused in the new car, and it’s good to at least get the handle installed before too many other parts get installed around where it’s going. While I was looking closely at the parts, I noticed something I hadn’t before. Everyone has commented on how much the original Miata looks like an old British sports car, but when you’re working on one, it actually feels quite different. A lot of the difference has to do with the small details. When you take a switch apart, you sort of expect to see the traditional British gimcrackery made of brass rivets, bits of wire and springs. Instead you find a hermetically sealed microswitch with some high tech connector and several “inspected by” stickers. Of course, this type of detail is probably why mi Miatas have always been so much more reliable than my MG. This is the switch which makes the brake lights go on when you engage the handbrake lever. As you can see, it looks like something straight out of the MG. 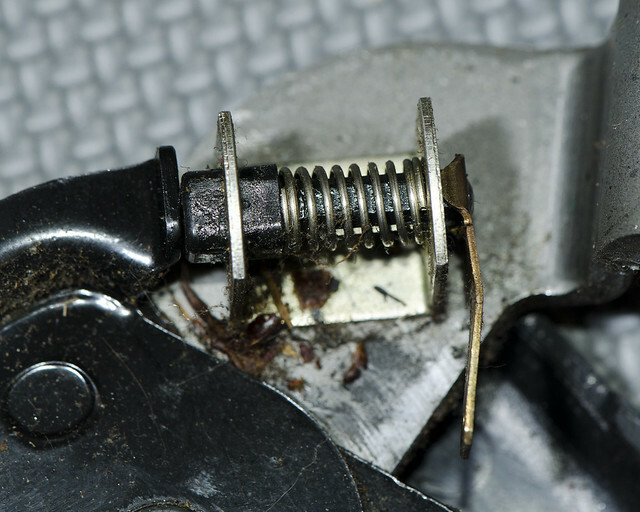 The handbrake lever presses against a pin which is held by a spring, and that breaks a connection to ground. It almost looks like something that one of the engineers did deliberately as an homage to the original. But I will point out that the equivalent part on the MG is hanging out of the bottom of the car getting splashed with mud and road slime, while this one is protected by not one, not two, but three separate shields. You can tell from the picture that some cruft managed to sneak in over the years, but it certainly held up better than the original would have. I guess that it pays to know exactly when it’s safe to indulge in a bit of nonsense like this.